"If you want to know what's going to happen in the future, looking at the past provides an important perspective," concluded Ohio State researchers. "Global warming has happened before, and in some cases the consequences were severe." Because of environmental consequences of rising temperatures, those species that survived the extinction didn't fully recover for 5 million years according tgo a new study that examined how life was forever altered by giant volcanic eruptions in the Early Triassic period – an event now called the "Great Dying". The period offers clues as to how climate change might impact life today, said Ohio State University's Alexa Sedlacek. "The lesson is, life doesn't just snap back," added Matthew Saltzman, professor of earth sciences at Ohio State. "We've long known from the fossil record that there was a long period with very little recovery right after the Great Dying. It's as if life had a 5-million-year hangover. Now we know why." The Siberian Traps eruptions created millions of square miles of new igneous rock, and released massive amounts of carbon dioxide into the atmosphere at the same time. For 5 million years, the carbon dioxide periodically reacted with water to form acid rain, which ate away at the rock, sending tons of sediment into the oceans. "It was a game-changer, biologically. Fish would have had silt in their gills, coral reefs would have been buried – as far as we can tell, the things that truly thrived in the ocean during that time were microbes," Sedlacek said. Sedlacek and Saltzman analyzed sedimentary rock formed on a tropical ocean floor 250 million years ago. Chemicals they found in the rock confirm that after the volcanic eruptions of the Great Dying, huge amounts of the Earth's surface were being weathered away by greenhouse gases in the atmosphere. Earth's climate was chemically altered as a result. The ocean was highly acidic, clogged with sediment – and warm as a modern hot tub. "People are understandably interested in the Great Dying because 90 percent of marine species went extinct," Sedlacek said. "But the recovery from that event is equally important, because the survivors determined what kind of life we have on Earth today. Extinctions are still happening today and though things were much worse back then, the greenhouse gases that were made by volcanoes are analogous to the man-made greenhouse gases we have today. So our findings have the power to inform us about modern climate change." The researchers studied chemical elements in samples of limestone taken from northern Iran, which was a shallow tropical ocean during the Early Triassic period, from about 252 to 248 million years ago. The study provides the first-ever link between the elements strontium and carbon that were deposited in the rock at that time. Both changed in ways that indicate dramatic climate change was taking place in the world above. When the rock they studied was being formed 250 million years ago, all of Earth's continents were joined together in a super-continent called Pangea. Up to 90 percent of marine species and 70 percent of land vertebrates had just been killed by massive volcanic eruptions from the region now called the Siberian Traps, which covers much of northern Asia. 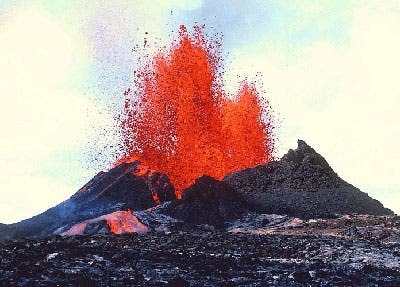 What caused the eruptions is not certain. The consequences are certain, however: the volcanoes spewed enough molten rock to cover millions of square miles, and enough greenhouse gases to dramatically increase Earth's temperature. The limestone used in this new study came from collaborators in Austria, who retrieved it from a gorge in the region of Zal, near the northern Iranian border. The Austrian researchers measured the amount of carbon in the rock, and confirmed that Earth's natural carbon cycle and climate were unstable for 5 million years after the Great Dying. Colleagues at the University of Cincinnati, who worked with the Austrian researchers, demonstrated that large amounts of sediment were collecting in the ocean. They then sent the samples to Ohio State, where Sedlacek and Saltzman measured the ratio of two forms of strontium, strontium-87 and strontium-86. This ratio is an indicator of how much bedrock was being weathered away from the Earth's surface. They found that as the carbon level was increasing during that 5 million year period, so was the strontium ratio: from 0.7070 to 0.7082. That may sound like a small change, but it actually indicates that, for the species that survived the Great Dying, the oceans were a very inhospitable home. The researchers point to a recent study published in the journal Science, which found that ocean temperatures at the time were around 104 degrees Fahrenheit – close to the maximum recommended temperature for a short dip in a hot tub, but not a comfortable temperature to live in 24 hours a day. Taken together, these findings explain why life took so long to recover from the Great Dying – and may imply that life on Earth today will face similar problems in trying to recover from the current climate change. Though tropical ocean temperatures today may reach only 80 degrees Fahrenheit in the current warming, carbon dioxide, acid rain, and ocean acidification are already proving to be a problem for ocean life. Much research today focuses on understanding what the future holds for ocean species, coral in particular. From that perspective, this study provides a rather foreboding prediction: that there's no easy road back to prosperity once species start going extinct. For more information: "Coupled C and Sr Isotope Stratigraphy of the Early Triassic of Zal, Iran: A Record of Increased Weathering," Geological Society of America presentation.